PHOTO: Gayle Pueschel, one of our dedicated volunteers, committed to keeping the food bank shelves stocked and tidy. Your financial support makes a world of difference. Please give generously! 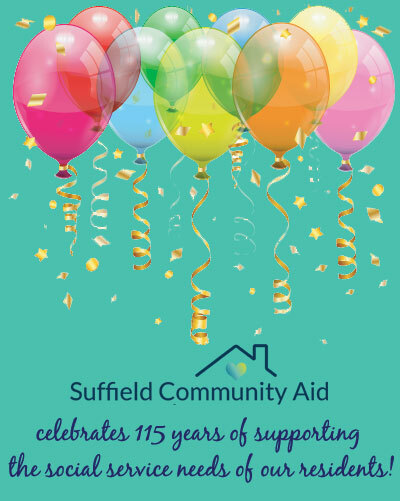 Suffield Community Aid, (SCA) – your local safety net! Formerly Emergency Aid Association, the SCA provides supportive health and social services that positively affect the well-being of Suffield residents during periods of need. The SCA is here, as it has been since 1903, to offer the resources and support that community members require to move forward in their lives. We strive to enhance the full potentials of all residents, and thereby, improve the overall quality of life in our community. Please join us at the Suffield Police Department on Thursday, April 25th at 6:30 PM to learn how to protect yourself and your loved ones. Letter Carrier’s Food Drive – Leave your non-perishable food donation near your mailbox on Saturday, May 11th. It helps Suffield residents in need! Presented by the Alzheimer's Association - CT Chapter, Nicole Matson coordinates this group which meets the last Tuesday of the month at 11:00 at SCA. Contact Nicole at 860-810-6123 or Pat Beeman at 860-668-1986 for more information. SCA’s Annual Report: Who we are and what we do!